Wolfgang Amadeus Phoenix is the fourth studio album by French indie rock band Phoenix. The album was released on 25 May 2009 by V2 Records. While the band’s previous work enjoyed a moderate underground following, the release of Wolfgang Amadeus Phoenix drew the attention of a more mainstream audience. In the US, Phoenix began a promotional tour including performances on several late night talk shows. Wolfgang Amadeus Phoenix continued to gain momentum with the increased exposure of the tour. The album had the critics attention and despite a slow climb in alternative music charts, eventually reached the top 10 for the year. 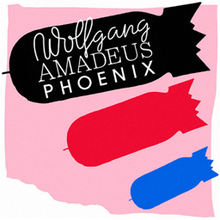 “Wolfgang Amadeus Phoenix” earned the band a Grammy Award for Best Alternative Music Album at the 52nd Grammy Awards held on 31 January 2010.